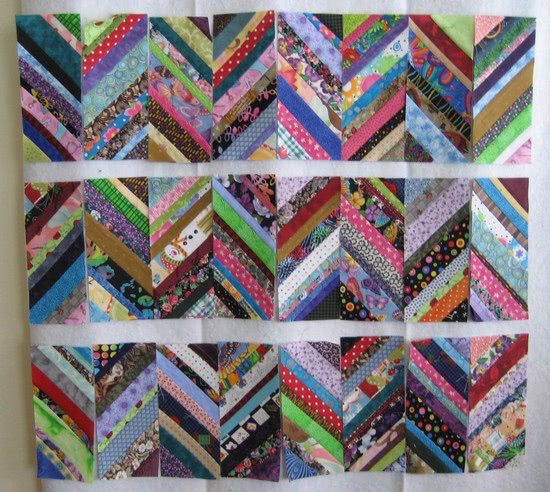 If you like strings, are interested by the rectangular proportions of the blocks we’re making this year, but aren’t crazy for hearts, check out these scrappy herringbone blocks Michelle is making on Quilting Gallery. The proportions are slightly different (her rectangles finish at 3-1/2 by 8-1/2 inches). If you like the look of string fabric but struggle with making strings on foundations, there’s a good tutorial in her post, too. Those would make a really cute companion block to pair up in a quilt with the February hearts!